Many people are looking toward online therapy for a variety of reasons. For some the convenience of teletherapy makes it easier to fit into their busy schedule. For others, living in outlying areas can make finding a provider difficult. Whether you are in the Portland area or in another part of Oregon, I can help if you prefer teletherapy over traditional face to face counseling. 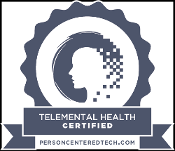 I have been trained in the nuances of distance counseling, hold a certificate in Telemental Health, and have utilized this mode of therapy on multiple commercial platforms in addition to using it in my private practice. What Does Online Therapy Look Like? Online therapy, or telemental health, looks a like like face to face counseling, but you are able to do it from your home or any other private place where you have an internet connection. Just as in face to face counseling we will set an appointment time, but instead of coming into the office you receive a unique link for a video appointment. At the time of the appointment you will follow that link to the secure video appointment where we will be able to meet virtually. If you prefer a phone session to a video session there is an option for that as well. There is still a lot to learn about telemental health. However, as more research is done the effectiveness of telemental health for treating issues like depression, anxiety, stress, relationship issues, and changes in phases of life is promising particularly when the cognitive behavioral therapy approach is taken.